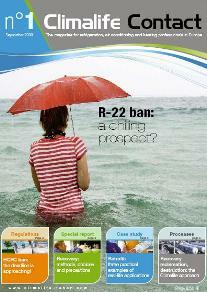 R-22 ban, the deadline is over ! R‑22 ban, the deadline is over ! Since 1st January 2010, the use of virgin R‑22 is prohibited for the maintenance and servicing of refrigeration and air-conditioning equipment. Only recycled or reclaimed R‑22 is allowed until the end of 2014. Today it is estimated that some 100,000 tonnes of R‑22 are currently in use in Europe. We already know that the amount of R‑22 recovered annually will fall well short of meeting the maintenance needs. In some countries this situation might even become critical. The need to replace this refrigerant is therefore more urgent than ever. In order to top up leaks on R‑22 systems in 2010 and ensure the continuity of your maintenance contracts, Climalife can offer reclaimed R‑22, marketed under the name of R‑22T. either treat your R‑22 upon request and to place R‑22T at your disposal in the containers of your choice. or to store your R‑22T on one of our industrial sites after signing a storage agreement. Our Services team will be happy to discuss any specific requests you may have for on-site recovery, system recharge, etc. R‑22T is available in a range of containers sizes. Contact your Climalife sales representative for further information on our R‑22T offer. R‑22T’s specifications ensure a recycled quality product, with at least 95% purity garanteed. To ensure that the R‑22T we produce is of the highest quality, Climalife’s laboratories always perform analyses both during and after the reclamation cycle. A question, more information ? R‑22T is a high quality HCFC resulting from the recovery and reclamation of R‑22 executed on our industrial sites which are entitled and certified to carry out this activity. Where can I buy R‑22T ? At Climalife – Contact your sales representative. In which type of containers is R‑22T available ? R‑22T is available in small and large containers. Until what date R‑22T will be available ? Until the end of 2014 or before if stock is exhausted. What procedure must I follow when I use R‑22T in an installation ? Apply the same good practice as you used with virgin R‑22. Which type of oil should I use with R‑22T ? Use the same type of oil present in the system. Is it allowed to store R‑22T ? Yes, but virgin R‑22 may no longer be used as from 1st January 2010. How long can I use R‑22T ? Until the end of 2014. Must I adjust the safety relief valve when using R‑22T ? No, the same settings as for R22 can be used.